8-bit consumer video provides about 10 million colors (219x219x219 in RGB). The human eye is capable of distinguishing at least 10 million colors, so 8-bits are adequate for most consumer applications. We have been patting ourselves on the back for the last several years for having access to reasonably affordable external color management systems from the Lumagen Radiance line of video processors and DVDO's Duo. However, these two wonderful technological advances for consumer video offer color correction for six colors. Six. We can adjust the three primary and three complimentary colors. Since they also offered multipoint grayscale adjustment, let's be generous and say that you could adjust up to 6 colors and 10 shades of gray (up to 20 shades of gray for the Lumagen). That leaves the remaining ten million colors unadjusted. This can be important either when the display exhibits non-linear colorimetry or when a standard color management system (CMS) in the display operates in a non-linear fashion. In either case, perfect color on the gamut boundary fails to provide good performance throughout the entire color space. This is not a mere academic distinction. Any experienced calibrator will report that many consumer displays that measure nearly perfectly at those six points along the gamut boundary also measure poorly if you go inside the gamut. What you see inside (where all of these 10 million colors reside) is often something of a mess. Consider the example below taken from one of the highly-praised Sharp Elite LCD rear projectors. Look at the two circled shades of red. Full red, the red on the gamut boundary, the one we would actually calibrate, looks nearly perfect, despite the fact that the less saturated red appears to be substantially undersaturated. This chart doesn't even consider errors in luminance, which can also be a problem. 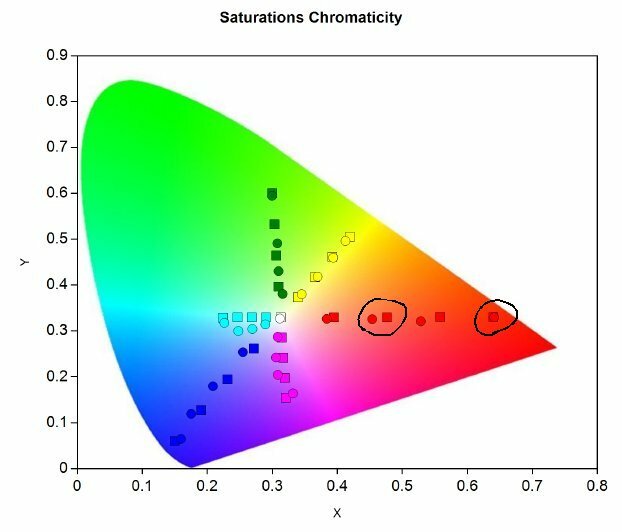 To see these errors, consider the next chart that tracks luminance errors at different levels of saturation. As you can see, at 100% saturation the luminance is too low at red, green, cyan, magenta. However, at 75% this profile completely changes. Now magenta's luminance is considerably too high, a swing of approximately 30%! To be clear, these errors are not subtle. The vast majority of colors provided by real-world content do not exist on the edges of the gamut, so when these remaining colors are wrong this can have a profound impact on the perceived color accuracy of the display, and explains why a display can sometimes measure well, but look, well, not so good. Until now, we have been able only to diagnose problems like this. Outside of very expensive commercial solutions and some HTPC options, there was no tool suitable for commercial video applications available to actually fix errors inside the gamut. The remaining colors are variations of luminance that do not appear on the CIE chart. For the remaining colors, the Lumagen uses interpolation to approximate where they should fall in the color space. Even high end professional applications must use interpolation simply because measuring and correcting every one of the 10 million colors is a practical impossibility. For anyone who has ever done a complete color calibration using the Lumagen Radiance, you can probably see one problem right away. Correcting six colors in three planes of adjustment is time-consuming enough. How can you possibly do this for 125 (or more) colors? Admittedly, it would be impractical, at best, to perform these corrections manually. For this reason, users really need some automated system to display all of the needed test patterns, measure each color, and then correct each if necessary. Display Calibrations has worked closely with Lumagen to develop an automated process for using this sophisticated color correction method seamlessly inside of ChromaPure video calibration software. An advanced version of the ChromaPure auto-calibration add-on is now available. This is an optional enhancement to the existing auto-calibration tool for Lumagen Radiance users only. It will provide the opportunity for users to obtain unparalleled color accuracy for virtually any display. Using a reasonably fast meter, you should count on at least 30 additional minutes for the advanced auto-calibration process to complete. This measures and corrects 124* (or more) colors instead of 6, so you can see why it would take much longer and why having a reasonably fast meter is important. In addition to the vastly improved color correction ability, it will also include data at the end of the report documenting the increase in color accuracy at 124 (or more) points. ChromaPure's Advanced Color Management module has offered the ability to measure and report within the color space for a couple of years. However, this has always been a mere diagnostic tool. We now have the ability to actually correct the errors that Advanced Color Management has diagnosed. This is a revolutionary advancement in color correction for the consumer market. More information is available on our ChromaPure Auto-Calibrate page. * We do not attempt to correct black. Advanced Auto-Calibrate is available at a CurtPalme.com discounted price. A discounted price is also available for existing Auto-Calibrate users to upgrade to Advanced Auto-Calibrate. (Auto-Calibrate is free for ChromaPure Professional users. ChromaPure Professional users wishing to use Advanced Auto-Calibrate only need to pay the upgrade price). Sweet!!! I have the Pro version ! cool this added accuracy will definitely benefit a blend!! Looks exiting. Cant wait to get the auto calibrate up running. Is there no one that have seen the result of this new feature.? I'm exited to hear some feedback..
"Just to say thanks for convincing me to buy the Radiance Mini! Calibrating my TV is now so much easier and the 125 point calibration fixed the problems I had with oversaturated Red and Green, it's subtle but my image is now more natural and my greyscale is now perfect. This device has also a lot of side features that are really nice like the gamma factor and the fact that the radiance has many memories is really great for day/night viewing settings. That really brought my TV to another level." - Stephane S.
I ordered it yesterday, just waiting for the download instructions I guess. it wasn't an instant download. Tom will be in contact soon with further instructions. He usually replies the same day. Yep , Just got the e-mail. There is anew version they are waiting on. If you have a blend or Stack or want two displays to look as close to each other as possible then you need to get this add on!!! to get them to a base line greyscale I just went ahead with how they were . I messed around a bit with Zone contrast by eye and altered the baseline G2 settings a while ago so they are not close to each other as in a baseline calibration. I first tried with my i1 Pro but at the low levels of a CRT luminance it doesn't like to play well through an entire long calibration session that a blend takes. So this is why I usually Profile one of my try stimulus Probes to it. Well for some reason the license for my i1 ProD3 was not working( sent an E-mail to tom for this), so I went with my older Chroma 5 Tri while I awaited the new license. I did one PJ then the other. the second PJ had low level issues while I stepped out below 20% . But i wanted to see how it looked with both PJ's on . Not bad!! There was a green tint for some spots because of the error at 20% and lower but the rest looked good if not great. At least better than before the advanced 125 point auto cal. So It was late and called it a night. In the mean Time Tom already had my new license ready. So I could not wait to come home from work and re calibrate the second PJ with the i1 pro D3. So I went and fired up both PJ's and muted the 1st and let the 2nd warm up. I then ran the Advanced auto cal with the D3. Much faster and much more accurate. I then turned on both and looked at the results. WOW even with two different probes the picture was the best I have seen my Blend look! So as I type PJ #1 is getting the i1 ProD3 advanced auto cal treatment now. I cant wait till I get enough time to do a proper baseline CRT calibration with Zone contrast as well and then recalibrate with the Advanced 125 point auto calibration. I'll also profile the D3 to the i1 Pro and also see if there is a way in Chromapure to select my own target White point for the base line. If I can measure one PJ's white point and make that the new Target i'll be golden! Great work Tom and everyone else at Chromapure!!! Very cool. I love hearing success stories like this. Proof that doing 125 point calibration really helps with multiple projectors if you want them all to look the same. Enter Lumagen. 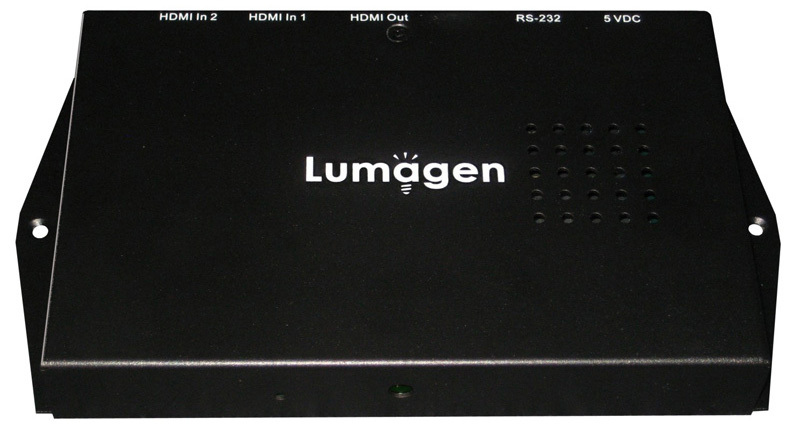 Lumagen has released for the Radiance series of video processors a firmware update to all of their processors that includes a new 125-color matrix adjustment option. 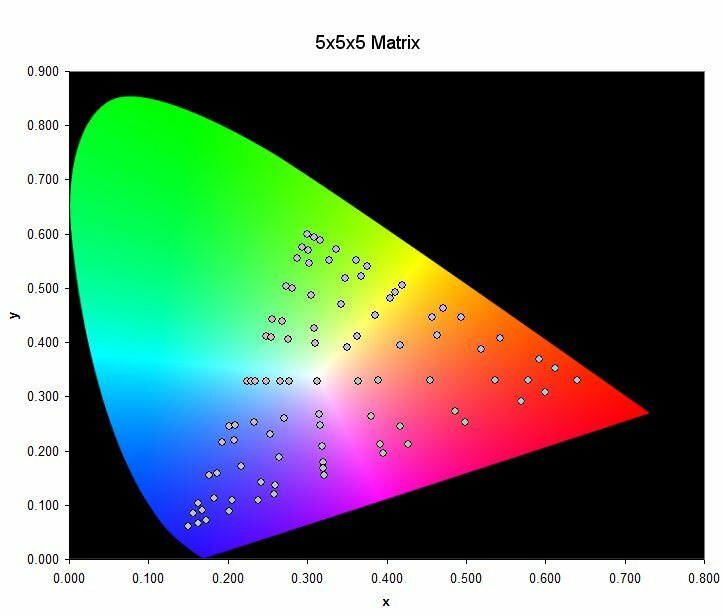 This means that instead of being able to correct the hue, saturation, and luminance of six colors, you can now perform the same correction on 125 colors distributed throughout the gamut. This is a revolutionary advancement in color correction capability for consumer video. In two dimensions the 125-point matrix looks something like this. The remaining colors are variations of luminance that do not appear on the CIE chart. For the remaining colors, the Lumagen uses interpolation to approximate where they should fall in the color space. Even high end professional applications must use interpolation simply because measuring and correcting every one of the 10 million colors is a practical impossibility. For anyone who has ever done a complete color calibration using the Lumagen Radiance, you can probably see one problem right away. Correcting six colors in three planes of adjustment is time-consuming enough. How can you possibly do this for 125 colors? Admittedly, it would be impractical, at best, to perform these corrections manually. For this reason, users really need some automated system to display all of the needed test patterns, measure each color, and then correct each if necessary. An advanced version of the ChromaPure auto-calibration add-on is now available. This is an optional enhancement to the existing auto-calibration tool for Lumagen Radiance users only. It will provide the opportunity for users to obtain unparalleled color accuracy for virtually any display. Using a reasonably fast meter, you should count on at least 30 additional minutes for the advanced auto-calibration process to complete. This measures and corrects 124* colors instead of 6, so you can see why it would take much longer and why having a reasonably fast meter is important. In addition to the vastly improved color correction ability, it will also include data at the end of the report documenting the increase in color accuracy at 124 points. thanks for the update . i have pro version .so please let me know from i purchase new and at-least version ..is there any option for free version of this . ; so please let me know if you have some information about this . alina, its a 79 dollar upgrade if you have the pro version. $74 at our CurtPalme.com discounted price. ChromaPure now supports 729-point gamut calibration. This feature is available for free to existing Advanced Auto-calibrate users. Calibrate to previously unheard of levels of accuracy completely automatically on any display type. The 729-point calibration is only available when ChromaPure is used in conjunction with one of the new Lumagen Radiance 20xx models of video processors. (The older Radiance Mini/XS/XE models are limited to 125 point calibration due to limited space in their FPGA). 729 points requires a massive amount of meter readings so a very fast reading meter like the Display 3 PRO is highly recommended.